in garter rib, motif in pattern. The Vodka Collection started with a conversation about what we like to add to a basic sweater when knitting. Each of us chooses what makes us happy, from simple to complex, depending on our skill level, preferred style, and mood. With The Vodka Collection, I wanted to look at the V-neck cardigan from that perspective. The Collection features 4 designs, and 3 patterns, covering this spectrum from TV knitting to a statement sweater. 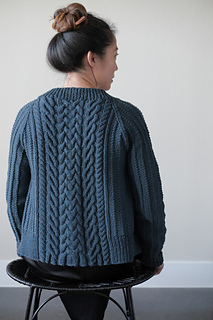 The sweaters are all designed in YOTH’s gorgeous FATHER yarn, a domestic Rambouillet that’s pretty fantastic no matter what you do with it. Vodka On The Rocks is the second pattern in the series, adding a bit of texture and some cables to the mix. 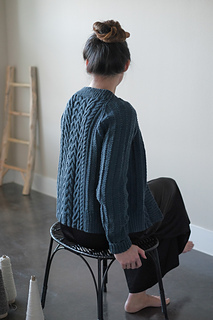 The body is knit from the bottom up and sleeves are worked separately and joined at the yoke. Construction is seamless, but there’s just a bit more detail this time. Cable instructions are both charted and written. The result is a sweater all about color, bold cables and overall texture, paired together to create a dramatic cardigan. Strong vertical lines and diagonals are placed so they are flattering on the body, and I’ve added a little detail in the final cable shaping along the V-neck. Plus, the details really pop in a vibrant navy blue. Both the texture and the cables are easily memorized, and modifying for width or length is also simple. 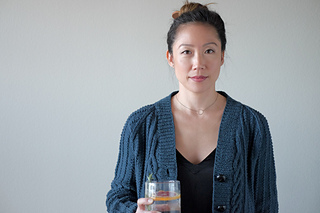 It’s like mixing up a gin and tonic - only a few ingredients, and a totally satisfying result. Sizes based on width around bust, including button band, in final blocked fabric. For fit as shown, I suggest 2-3” of ease, based on your actual bust size. 1200(1250,1300,1350,1400) (1450,1500,1550,1600) yds 1097(1143,1189,1234,1280)(1326,1372,1417, 1463)meters. p2. bottom of pg: “width of pocket” needs to be deleted.